GGPC Logitech G January Winner Announced! January Winner is: Gemma D! Congrats Gemma, we know you’re going to love all this awesome gear! Throughout January, If you got yourself a Good Gaming PC you could register to redeem a G240 Gaming Mouse Pad to go with your new GGPC + you’ll went into the draw to win some of the latest gaming gear! Included in this months GGG Prize Pack is the latest version of the now iconic G502 series, the Logitech G502 HERO Gaming Mouse which is one of the top-rated Gaming Mice in the WORLD! Incredible gear, amazing January fun ahead – check out the latest range of Good Gaming PC builds today! Throughout May, if you grabbed yourself a Good Gaming PC you could register to redeem a G240 Gaming Mouse Pad to go with your new Gaming Rig. Crafted for maximum control of your mouse movements, the G240 provides edge-to-edge performance on a clean surface with just the right amount of friction for low-DPI manoeuvres. Your gaming will benefit from the consistent surface texture, also giving your mouse sensors better imagery for translating mouse movement into cursor movement! Our grand prize for May consisted of three distinctly impressive pieces of Logitech G Gaming Gear, the first being just released Logitech G512 Linear Gaming Keyboard! And speaking of a gaming mouse – we’ve got a great one to go with this! The Logitech G502 Proteus Spectrum Gaming Mouse with full RGB LED Lighting and tunable weight options included. Get maximum tracking accuracy from the responsive PMW3366 optical sensor which works with exclusive Logitech G Delta Zero optical sensor technology to minimize mouse acceleration and increase reliable targeting. Adjustable RGB lighting lets you select from up to 16.8 million colours and as our lucky winner is going to have a complete setup, Logitech Gaming Software will allow them to choose lighting to match their style, and then set this theme over the whole kit – synchronizing lighting patterns and effects to bring the gaming setup to life with breathing or light cycling light patterns! Ohhh that’s a pretty amazing setup we’ve got here, but it’s not over yet! Check out the all the latest Gaming PC and awesome Logitech G prizes at our retail partner PB Tech NZ, and keep your eyes on the GGPC PC Gaming Blog as we’ll announce the lucky MEGA PRIZE PACK winner at the end of April! Good Gaming Headset – Logitech G533 Available NOW! 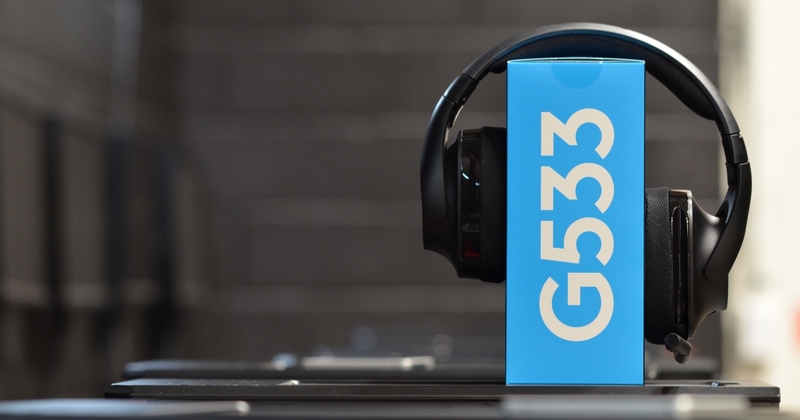 UPDATE: The G533 Gaming Headset has landed in NZ! There are a few really nice gaming gaming headsets available in NZ today and a new piece of audio goodness has just released from those fine folks at Logitech G! The G533 is a sleek new gaming headset that’s using the same Pro-G audio drivers found in the exceptional 933 Artemis Spectrum, it’s also packing DTS X 7.1 surround sound which accurately replicates 7.1 speaker position so we can enjoy all the ambient sounds and audio ques that make playing games with a nice headset oh so enthralling 🙂 It’s also handy for a multiplayer gamer as being able to hear which direction gunfire is coming from can be a pretty neat tool for getting into the action (or getting out the way :P) You can configure all this and more with the Logitech Gaming Software. UPDATE: We’re well into testing this one out for ourselves now and it’s really good, a few things have really stood out to us. Firstly the unobstructed range appears to be well over 15 metres, with the USB dongle in our GGPC editor rig we still had a perfect connection all the way down in the other end of the workshop and that’s a good 30 metres away! When testing in a two story house we were able to head downstairs and into the kitchen to grab a drink and still maintain voice comms while waiting in que, great stuff Logitech 🙂 Battery wise the headset has just crossed the 16 hour mark and do another quick test soon to see how long this thing last at full volume (which we don’t advise, these ear cannons are loud!). Keep your eyes on the GGPC Computers Blog for the latest!